Have big dreams of running a 5K one day? Need to Lose some weight? Got a list of questions on how to properly train to run for 3 miles? Have you started training before, only to quit a short while later? You’re not alone. Train with me for a few short weeks and I’ll Give You a Successful 5K Run. Inspiration: Encouragement you will need when training gets tough. An Exclusive Race Day Podcast with over an hour’s worth of great music and support and coaching from me. I’m not a natural when it comes to running. When I trained for my 1st 5K, I was 100 pounds overweight, and I hadn’t run since I was child. However, I knew that fitness was important to my health and weight loss goals. Training for a 5K was the perfect way for me to get in shape and tone up. You’re a runner that’s lacking motivation. “Hey Carli, I ran my first 5k in 29.16 today! Couldn’t have done it without you!” ~Timothy J. Hey from 90 pounds down so far, about 33 more to go. Ran five 5K races in the last year, did my C25k training with the help of your podcasts! Still running regularly and enjoying it so much! ~ Clara from Graceville, FL! Carli Fierce is an ACE Certified Group Fitness Instructor and a Certified Lifestyle Fitness Coach. She has been blogging and training for race events for several years, and has one of the most popular 5K training podcasts to date. 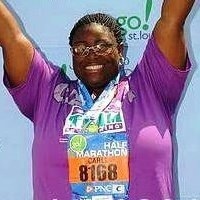 She’s helped thousands of people become first time 5K runners and countless others to get motivated and lose weight. She openly shares her struggles with weight loss and her journey to fitness here on her blog RunningIntoShape.com which inspired over 1 Million visitors and soon to be runners. This 70+ page resource is ready for you to download right now. It retails for only $9.99 $4.99, this is a resource that is designed to bring life and revitalization to your run again and again as you continue to use it over coming months. 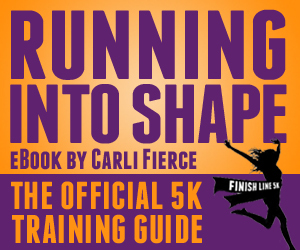 If you are not satisfied with the Running Into Shape: The Official 5K Training Guide PDF eBook after 30 Days, Just let me know and I’ll refund your money – that’s how confident I am that this is a resource that will help you become a new runner or become better at running a 5K. If you have any questions about the book or problems with the download, don’t hesitate to EMAIL ME. Get the Running Into Shape: The Official 5K Training Guide PDF eBook by hitting the following button and give your run the kick start that it deserves! Note: Although this book does reference long distance training techniques, This eBook is designed for runners who want to run a 5K or improve their current running techniques.